Truckers all-time favorite Cobra CB radio is one of the leading and aggressively improving brands in the Citizen Band (CB) radio industry. Your most-loved basic and reliable radio 19DXIV and the compact 19ULTRAIII is at the very top; followed by the 25LX and 29LX CB radios which are based on the 25LTDCLASSIC and 29LTDCLASSIC platforms, respectively. Now here comes the Bluetooth Wireless technology on two radios (29LXBT, 29LTDBT), where you can talk safely and hands-free for hours on the road. Get all the features you ever needed in a single radio unit. Here is a little tip: Driving mostly at night? Choose the NightWatch CB radios with illuminated front pane to maximize night vision. Wanted clear and loud communication? Get the 18WXSTII with SoundTracker and Noise Reduction. Not enough space? Grab the Remote Mount Handset HH-75WXST or the Handheld HH50WXST CB radios – small and compact but still pack with Full Features and LCD Display. Feel free to browse and choose the best radio to suit your needs. Cobra′s 29LXBT Citizen′s Band (CB) radio with Bluetooth interface allows you to newer take your eyes off the road, while talking on your cellphone. Talk hands-free with your fellow drivers with this one central communication device while you focus on your driving. 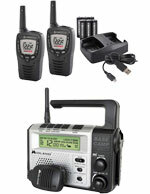 Cobra offers you the 29LTDBT CB radio with Bluetooth wireless tech. Calls to your mobile phone are synched with the CB unit allowing you to make your` conversations with other truckers even better. Communicate safely and effectively with the Cobra 29LTDBT. Get Cobra′s 25LX CB radio based on the 25LTDCLASSIC platform. Audible key tones, RF output power, plus a customizable night/day settings to enhance readability in very bright and dark conditions. The Cobra 29LX Citizen′s Band (CB) radio gives you access to information on channel 19, and the emergency channel 9 to help you keep safe on the road. The CB unit also comes with a 10 channel Weather receiver, that broadcasts 24/7. Cobra 25LTDCLASSIC is based on the original Cobra platform with a lot of bells and whistles. Top features are RF Gain, Dynamike boost, Volume and Squelch controls and channel selector. Trusted by truckers over the years for performance and reliability. Manufactured based on the Cobra original design, the 29LTDCLASSIC CB radio is best known for its performance and durability that most truckers love. The radio unit enables loud and clear communication with fellow drivers on the road. The Cobra 29LTDCHR is the 29 Classic with a modernized Chrome Design, making it a smart looking CB radio. Manufactured with a chrome cabinet, chrome microphone, blue channel display and signal strength meter and Talkback. Get classy on the road with one of Cobra′s best. Cobra gives you a 40 Channel mobile CB Radio that has Dual Watch feature to let you monitor two channels simultaneously. It also has SoundTracker Technology that improves the reception and transmission of radio signals. Adjust your Cobra 25 NW settings with the amazing feature of NightWatch Technology. The NW illuminates your CB Radio in the dark for easy controls. This is ideal for the night drivers looking for a reliable CB Radio with firm features. NightWatch technology in Cobra 29NWLTD fully illuminates the radio′s function settings for easy viewing at night. It has a classic white-silver complexion during the day and a fully backlit appearance at night. The HHROADTRIP Hand Held CB Radio is similar to the HH50WXST except that it includes a magnetic vehicle antenna which improves the range of the radio while taking it with you in a vehicle. 4 Watts AM Output Power as required by the law. It is like getting a magnetic mount antenna for about $13. Nice bargain. 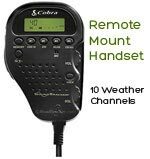 Cobra′s Remote Mount HH-75WXST CB Radio is a compact handset so it is ideal when space or mounting options are limited. All controls are on the mic, so the base unit can be mounted just about anywhere. The all-in-one radio unit can be hung using the included standard CB microphone hanger. Listen to News or Weather updates with Cobra Citizens Band 2-Way HandHeld CB Radio. It can scan all 40 CB channels and can monitor two pre-selected channels simultaneously. 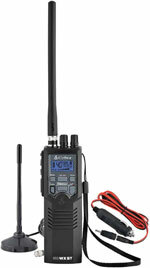 Looking For a 2-Way Walkie Talkie?